On March 21, Chaminade University held its annual Criminal Justice Expo in the Clarence T.C. Ching Conference Center. Chaminade’s Career Preparation Office, the Criminal Justice Department and the Criminal Justice Club hosted the expo, which was free and open to anyone interested in pursuing a degree or career in criminal justice. Each year, the university welcomes representatives from various agencies in the criminal justice field to share about their work and answer questions from expo attendees. 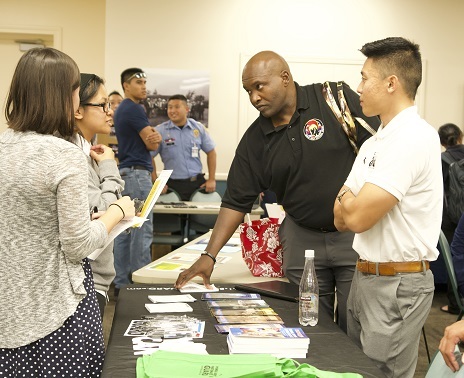 Representatives from 38 agencies attended the expo, including the Federal Bureau of Prisons, Hawaii State Judiciary, Honolulu Police Department and The Queen’s Medical Center. 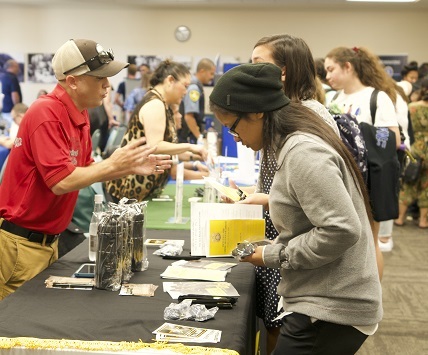 While the expo was open to the public, it served as a valuable opportunity for Chaminade students in the Criminology and Criminal Justice program to meet potential employers and learn about jobs they might be interested in pursuing after earning their degree. The Criminology and Criminal Justice program at Chaminade is known for being the largest and oldest in Hawaii. Students interested in careers in law enforcement, public safety, criminal justice or criminology can obtain an associate’s, bachelor’s or master’s degree from the university. The Criminology and Criminal Justice curricula also provide a foundation for students planning to pursue an advanced degree in areas such as law or criminology research.